Well here we are with 10 days to go on the current campaign and I wanted to address where we are at the moment. 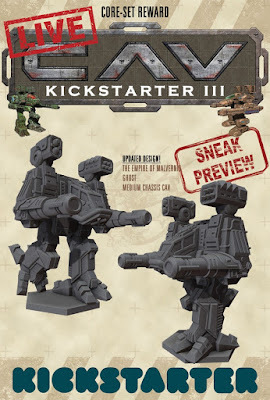 When I sat down and planned this campaign I had hoped we would be able to cover a lot more stretch goals early on and have a chance to offer a wider selection of models to appeal to backers who might not normally be looking for just "mechs." When that didn't happen I had to adjust accordingly and focus on what we as a company was trying to ultimately accomplish with this KS and that was to be able to offer more game-based models for people to play with. That left the dropship though still on the horizon and how could we still work it in and not get in the way of adding other models? Unfortunately, within the confines of the current KS system, we don't have a way to let a backer pledge for this or that model or separate funds in any way. It's an all or nothing proposition. With this system though, trying to accomplish both goals is just not feasible. I have tried several scenarios but they all end up at the same place, the two goals competing against one another and ultimately causing both to fail. I had discussed setting the final stretch goal to the dropship at the end of the campaign but here is what I'm afraid will happen. The dropship is a $75K stretch goal. That's as lean and mean as I can make it for a model this size. By waiting till the end, we would be hoping to get those funds in the last couple of days. I'm not saying we can't but right now we are not trending that way. So, we have a big crash at the end as dropship-only backers cancel their pledge and money we might have gotten for extra models to go in the core set is gone as well, since we had stopped working on those. A definite catch-22! As I've mentioned before, learning how a KS works is a "trial by fire" event that quickly takes on a life of its own. While this is our third, we tried new things that just haven't panned out. I am certainly not above admitting when something goes wrong and I do my best to jump in there, make the best of it and make corrections while making sure all of our backers are kept in the loop. With that in mind I have decided that right now is not the best time to push for the dropship and stay centered on adding additional CAVs and vehicles to all of the models we already have opened up. This keeps the remaining campaign on track to add even more of those models to the mix. So what about the dropship? It will end up becoming part of a new KS focused on it. By doing so I think we can create a campaign that will be better overall to achieve it's success and can offer the model as a better value overall. While the delay is unfortunate, it is the best way going forward in my opinion. 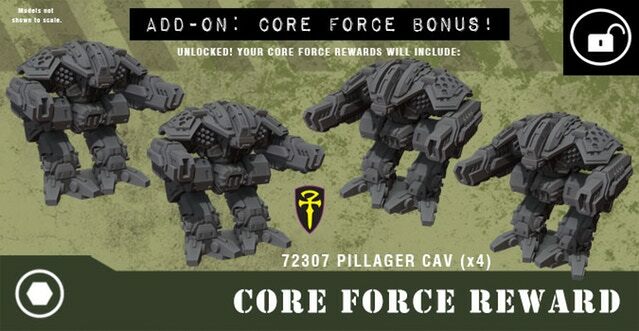 Please be aware we do have backers that have already pledged to the campaign specifically for the dropship or added to what they had planned for getting the Core Force reward. After the release of this update I fully expect those funds to be withdrawn, but by getting this behind us now we can look to the remainder of the campaign to add what we can for the models we can achieve. But there is a positive!!! Never one for just doom and gloom (even though it is October) and as my way of backing up my "oops" moment, I am adding the Malvernian Pillager CAV to the Core Force as a BONUS reward! So there you have it, for better or worse but at least we all know what we are working for going forward. I appreciate your support and hope we can finish strong!